Everyone loves getting something for free! Me too. Now, I must admit that I spend a hefty amount of pocket change on Teachers Pay Teachers buying resources that other music educators have created so I am delighted with the occasional freebie that I find too. Here's a list of some of my favorites. This is one of my favorite freebies! I've used this with 1st, 2nd and 3rd graders. My 3rd graders did it as part of a workstation rotation as it didn't take them as long to complete the activity. 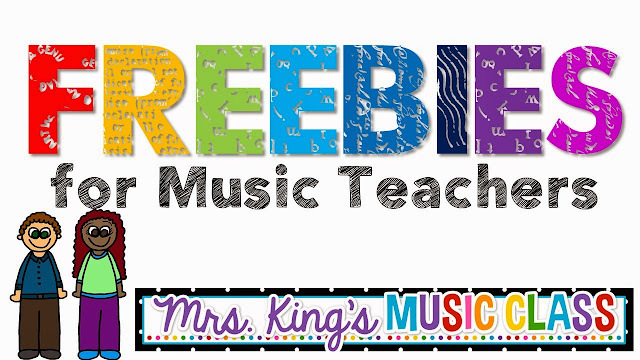 This freebie has students match the syllables of themed words with simple rhythms. This is a jungle themed one, but there are many more to choose from. So, I teach this song most years to my 1st graders, but this year it was even better with this freebie! Lindsay has done the work that I was too lazy to do myself. A cute and clever freebie for learning this song. This is so stinking cute! I've used this with 1st and 2nd grades with great success. In this interactive PowerPoint, students listen to a rhythm played by Freddy the Frog. Then, they click on the lily pad that has the rhythm they heard. The sound effects are so fun! Check this one out for sure. Amy is SO clever. Not too long ago she released several wristband products that are fun, practical and just plain genius! Try these Wristbands for Rhythm Practice for free and then check out her other sets. Aileen has many amazing freebies, but this little sample has been really useful to me for the last couple of weeks. I've been teaching my kiddos about the music of John Williams. The older groups enjoyed seeing the rhythmic notation for the theme and wanted to go and pluck it out on the xylophones. Fun! Tina has done a great job putting together a singing game that is perfect for assessment. I love the graphics in this because it seems that it would be something that appeals to boys and girls equally. I haven't used this yet, but only because this is something I focus on at the beginning of the year. I am planning to add it for next year. Angie suggests that you use bingo chips to follow along, but I think I might use the big stash of bottle caps that I use for Bottle Cap Staff activities. I have several different ways to track students when they are working in centers. Here are a few of the sheets that I use. I came across this fabulous little set of worksheets while looking for something else and knew immediately that they would make a perfect addition to my workstations for 6th grade. They come in a full color version which would be perfect for using in a private studio. Okay...I must admit. I'm a string instrument impaired. I dropped out of Class Guitar. Twice. I bought a ukulele one year during a snow apocalypse and gave up again. BUT...this freebie is fabulous for people like me. Why? Well...if a song has 1 or 2 chords you can play it with Boomwhakers or xylophones or Autoharps! HURRAY! Adding these to a workstation with Boomwhackers, xylophones or autoharps is instant magic. I used this little gem in a workstation with third graders. Brittany suggests that this is useful for younger grades, by it worked well in a workstation. I also instructed students to turn the page over and write out the notation. Tiptoe=barred eighths and so on. I just love Cori's style. So cute! These worksheets are wonderful additions to workstation rotations for practically any elementary grade. This is a great whole group activity, but it also works a part of a workstation rotation. It asks students to reflect on their musical summer. Great for back to school time! 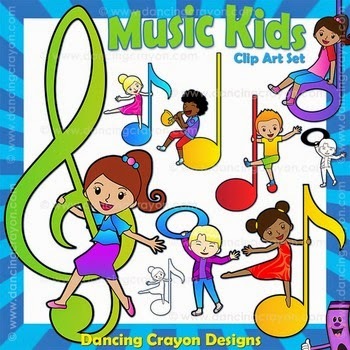 My K-4 kids love these vocal exploration sets during workstation rotations. I usually set them on a music stand and leave 4 or 5 different pointers for them to choose from. I have toys, pointers from the teacher store, flyswatters, magic wands, light sabers and more that we can use as pointers. 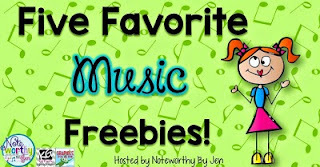 Want to check out even more freebies? Check out this blog linky party. Music bloggers are listing their favorites. Thank you to Jen from Noteworthy by Jen for hosting! 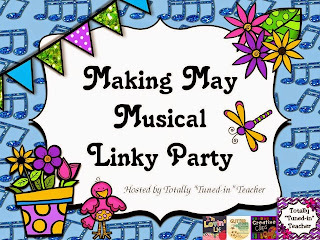 Today I am linking up with the Totally Tuned In Teacher for a linky party. Thanks Tina for hosting this great link-up before the next Teachers Pay Teachers sale! Check out her blog for more blog posts featuring great products. Peter and the Wolf Color by Note Kids love to do these and I love that they get a little extra practice identifying notes. My older students rarely get a chance to color so they really seem to enjoy these activities. 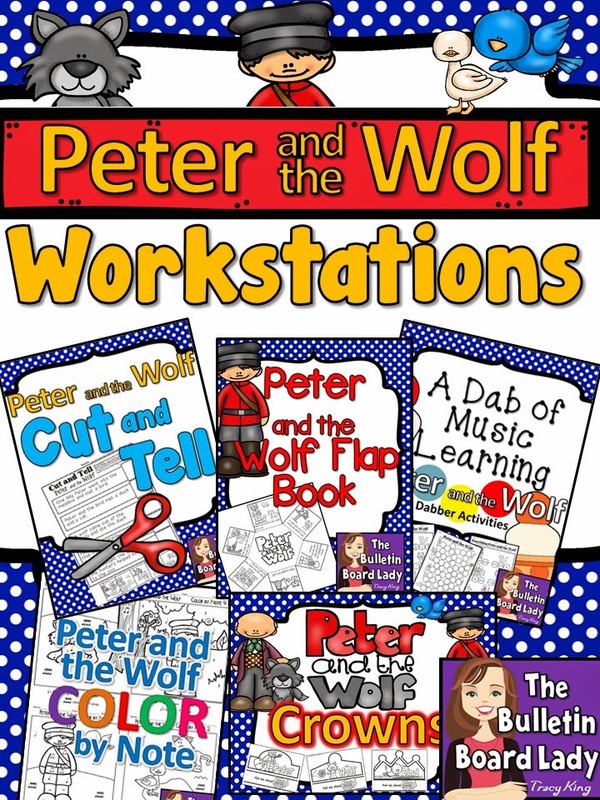 Peter and the Wolf Crowns -I must admit that I love these so much that I use them more often for a small group activity or whole group dramatization than I do as workstations. They work as a workstation though. You may want to do some pre-cutting if your rotation time is limited. 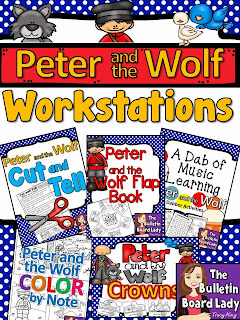 Peter and the Wolf Cut and Tell -Perfect for rotating through workstations. This worksheet asks students to read the story of Peter and the Wolf and then glue the matching pictures beside each sentence. Peter and the Wolf Dabber Activities --Seriously may run my dabbers dry this year! This dabber set ask students to match the characters with the instruments that play their theme. Peter and the Wolf Flap Book -I had a parent tell me that her son loved this book SO much that has nearly worn it out! *giggle* I love when that happens! It seems that I don't own EVERYTHING that David Row has in his store. At least not yet! LOL. 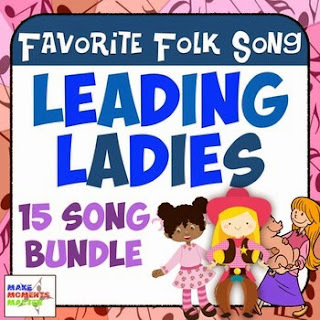 My kiddos love the songs in his Favorite Folk Song series and I love the format in which they are presented. Although they were designed as a bulletin board, I use them as instructional tools. Can't wait to try these. I don't even know what I am going to do with them yet! :-) Just gotta have them! The big TeachersPayTeachers sale is May 5-6. Use the code THANKYOU to save 28% on most items in my store!